Countless HTML courses are available on the internet. Let's explore 3 different ways to learn the most important web design language online. The web language HTML is used to design websites. Basic HTML knowledge can usually be acquired quickly. Many participants are already successful after a few days (or even hours). HTML is an abbreviation of Hypertext Markup Language. It is needed, for example, to structure content such as this text so that it can be displayed online. So HTML allows content to be shown on internet pages. 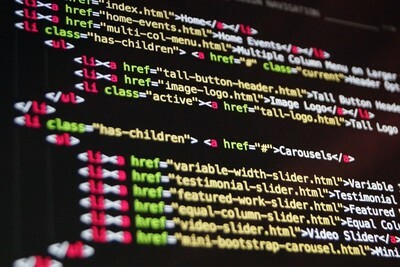 There would be no websites without HTML! Please note: In addition to pure content, the formatting and design also play an important role. These are done using the Cascading Style Sheet (CSS). Online instructions about HTML have been available ever since the internet was created. They are mostly found in text form and sometimes, they are supplemented by pictures and slides. The principle is very simple: You read the instructions and try to grasp everything as well as you can. It´s similar to reading a book on the topic. For example, a well-known HTML guide is "Learn-HTML". It has been around for more than 10 years. Pro: Yes, it is actually possible to learn HTML like that! Con: The design is rather simple and there is a lot of text. Modern online tutorials are quite different in comparison. Also, you won´t get a certificate. In recent years, there has been a boom in the number of YouTube tutorials. This is a bit more interesting than pure text documents because of the video format. On the other hand, it can be difficult to find a reputable and high-quality source. Anyone can become a YouTube teacher these days. One example is the tutorial by Quentin Watt. It gives basic information about HTML in 50 short videos. Pro: Often created by active HTML developers in a simple language that every learner can understand. Con: No professional teachers, therefore the quality varies greatly! Also, it is not possible to get a certificate. If you´re looking for a thorough learning experience, you will find numerous comprehensive video courses. These are comparatively high-quality and allow you to build a solid basic knowledge about HTML. In most cases, the most up-to-date HTML 5 version is taught. Because of the course format, you can discuss questions and possibly even receive a (paid) certificate. But the courses are longer and require investing some more time. A quick and efficient beginners´ course. Project-based course with a lot of coding. Comprehensive course with professional lecturers and certificate. Less focused on syntax, works with practical examples. Short but professional introductory course for beginners. Pro: Professional and high-quality courses that sometimes include a certificate or statement of participation. Con: You have to be willing to undertake a certain minimum effort to complete a full course. Intro video for the edX course. Want to Learn More Than Just HTML? Do you plan to further educate yourself about web design and become a web developer? ("Learn Web Development With Online Courses"). In this course series, you can learn how to become a full-stack web developer and build multiplatform mobile app solutions. Some prior HTML knowledge is required for this course. In our search portal, you will find more than 1,000 video courses on various computer science topics such as web design, web development and coding. We list thousands of video-based online courses, MOOCs and online lectures from 22 subject areas in our course directory. Are you interested in online courses? Subscribe to our newsletter here. And follow us on Facebook or Twitter now!